Catalogs > Ullman Sails > Ullman-Sails-Tri-Axis-Cruising-Sails. 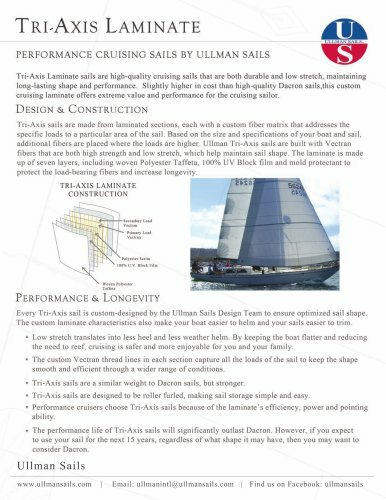 TRI-AXIS LAMINATE PERFORMANCE CRUISING SAILS BY ULLMAN SAILS Tri-Axis Laminate sails are high-quality cruising sails that are both durable and low stretch, maintaining long-lasting shape and performance. Slightly higher in cost than high-quality Dacron sails,this custom cruising laminate offers extreme value and performance for the cruising sailor. DESIGN & CONSTRUCTION Tri-Axis sails are made from laminated sections, each with a custom fiber matrix that addresses the specific loads to a particular area of the sail. Based on the size and specifications of your boat and sail, additional fibers are placed where the loads are higher. Ullman Tri-Axis sails are built with Vectran fibers that are both high strength and low stretch, which help maintain sail shape. The laminate is made up of seven layers, including woven Polyester Taffeta, 1 00% UV Block film and mold protectant to protect the load-bearing fibers and increase longevity. PERFORMANCE & LONGEVITY Every Tri-Axis sail is custom-designed by the Ullman Sails Design Team to ensure optimized sail shape. The custom laminate characteristics also make your boat easier to helm and your sails easier to trim. • Low stretch translates into less heel and less weather helm. By keeping the boat flatter and reducing the need to reef, cruising is safer and more enjoyable for you and your family. • The custom Vectran thread lines in each section capture all the loads of the sail to keep the shape smooth and efficient through a wider range of conditions. • Tri-Axis sails are a simitar weight to Dacron sails, but stronger. • Tri-Axis sails are designed to be roller furled, making sail storage simple and easy. • Performance cruisers choose Tri-Axis sails because of the laminate's efficiency, power and pointing • The performance life of Tri-Axis sails will significantly outlast Dacron. However, if you expect to use your sail for the next 15 years, regardless of what shape it may have, then you may want to consider Dacron.